Has anybody heard or seen these? They are from ancient russian times as well as england and other european countries. There are two types. One that you bake you bread on (leaving a small imprint on the underside of the loaf) and a tool that looks like a normal stamp but you press it into the side of a loaf before it goes in the oven. I am looking for the first type. I have thought about finding a jeweler to make them for me but not sure. This is a website to give you guys something to see. Let me know if you can help thank you. 5 Stars for bread stamps..
still my stars won't hold still. Very interesting bread history. Thanks! I checked out a book on Greek cooking a few months ago. They too used stamps for their breads, only the stamps were wooden. Is DC as in our nation's capitol? I was looking at these and trying to figure out how to make a stamp for myself, but not spend too much. First I thought a chunk of aluminum and grind it down with a dremel, which would be time consuming, then I thought to try cermaics. So in the near future I'll be hunting down access to a kiln and a hunk of clay that can be baked and glazed. This should prove to be both usable in the oven, and when glazed have a somewhat nonstick surface. I could probably find someone that does casting, but I think working in clay will be both easier and cheaper. Yes dc does stand for Washington DC. It has been my home for about 4 years and probably where my bakery will be opened. As far as aluminum is concerned: I don't feel very comfortable with putting aluminum on something that is wet and acidic, such as sourdough dough. Not really sure what I could use but clay is a good idea. Then I'll be coming to see you! I live about 2 hours west of DC, and I visit my sister who lives there. I cannot believe that there are no good bakeries there! What a disappointment! If you do open up a bakery there, post it on here to let us know! Great!! I love meeting other bakers. It is about 18 months away. Right now I am baking in a restaurant here. It is pretty cool I get to bake what ever I want and get paid for it Ain't life grand! Although I can't claim familiarity with many (or really, any) restaurants in DC, I'd like to know where it is you're working now. I request that our next meal out in DC be where you work. If you can't broadcast that due to employer issues, that's okay too. I have a small home op, so I too get to bake whatever I want and I get paid for it. Well, within limits--so few people like rye and many will only buy bread if it's in proper sandwich shape! There is a lack of a good bread baking culture here on the east coast (esp I think in the soft flour south) and it's nice to know there's someone else out there! I've seen a brick oven where the baker engraved "LOVE" into one of the hearth bricks. In every batch of bread he made love was on the bottom of the loaf. You could probably engrave into a pizza stone with a dremel or something. If it doesn't work you can just flip it over. I work in Alexandria, Va just outside of DC. The restaurant is called Restaurant Eve. I'll visit that address you included in your post. By the way, in the Greek book that included bread stamps, the stamps used were wooden. I'm not sure how well that works or how clear an impression it leaves, but that's just a thought. I did a quick prototype baker's mark out of a silicone baking mat. Not bad for a first try. That is cool. I might have to make one that says "Eat Me". Jack, you made me spew my tea. It was worth it. 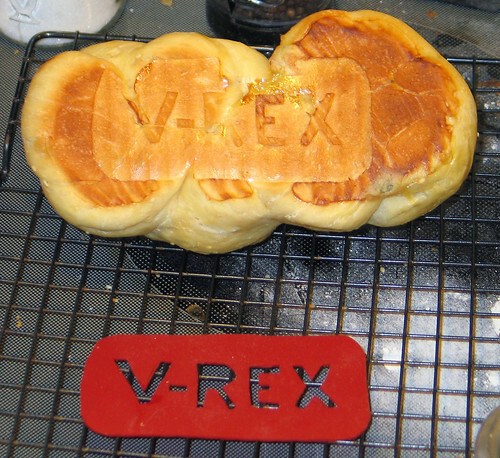 You can find bread stamps at a lot of cooking sites. Just Google "Bread Stamp"